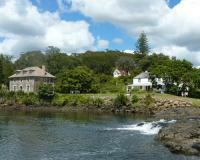 Kerikeri Basin historic precinct is part of the Tentative list of New Zealand in order to qualify for inclusion in the World Heritage List. Kerikeri Basin contains a number of sites representing the “early period” of contact between Maori and Pakeha dating back to 1819 when a mission was first established there. It is beautifully situated in a lush valley with a small waterfall and well worth a visit by anyone traveling in the Bay of Islands area. A few miles away from Kerikeri during the 1820s and 30s the port of Kororareka (present day Russell) was known as the “Hell hole of the Pacific” for its lawlessness, prostitution etc. The trade in muskets from such places by the Maori led to devastating results on the tribal balance and terrible wars. At the same time, in nearby places like Kerikeri, European missionaries were trying to bring law and order to the area and benefits to the Maori in terms of agriculture, literacy and an end to their practice of slavery and cannibalism – leavened of course with a good dose of Christianity! We saw 2 of the 4 locations listed on the UNESCO Web site as part of this T List site plus others. The Mission House built in 1822 is NZ’s oldest building and the nearby “Stone Store” was completed in 1836 (its lintel has the date “1833”). The Stone store is still run as a “store” downstairs, aimed at tourists but selling items which are appropriate to its history (e.g cooking pots!). The upper floor is a small museum. Higher on a hill above the wharf is the church of St James which is not mentioned in the UNESCO T List description. The building is the second on the site (the very first was built near the water) dating back to 1878 with an extension in 1963. Despite its later date it doesn’t seem credible that it could be excluded from a nomination given the importance of “religion” in the significance of the site. This document - http://www.doc.govt.nz/upload/documents/getting-involved/consultations/consultations-results/our-world-heritage/our-world-heritage-2.pdf (see section 2.1) states of the church that its “possible inclusion could be considered in the future should a formal nomination for World Heritage status proceed”. The other 2 mentioned locations relate to the Maori culture. We didn’t climb up to the terraces of the Kororipo Pa or visit the whirlpool but they are undoubtedly part of the “Cultural Landscape”. “Rewa’s Village”, which is inside the anticipated boundaries shown in the above document, is a modern reconstruction which “recapture the atmosphere of the average kanga of pre-European times”! I could see ICOMOS having authenticity problems with that! But is there really enough here to justify inscription of this site? My initial reaction was “no” – but then I think of that Holy Trinity Column in Olomuoc at .02ha! Surprisingly its completion in 1752 is only 70yrs before Kerikeri’s Mission house! Reflection and reading of the above document has led me to change my mind and conclude that perhaps there is a genuine chance of future inscription based on the Cutlural Landscape and the “meeting of cultures” aspects. Whatever – if you are in Northland you should put aside an hour or so to visit it!